In many cell types, Ca2+ acting as a signalling agent plays an important role in the control of cellular function. It is thought that these signals are mediated through oscillations in intracellular Ca2+ concentration ([Ca2+]i). The mechanisms underlying these oscillations are complex and they have only been partially elucidated. In addition, in larger cells such as in the Xenopus laevis oocyte, a variety of Ca2+ wave behaviour has been seen, including plane waves, pulsating patterns and spiral waves. This has lead to the frequent use of Xenopus oocytes in experimental studies of Ca2+ waves. The probability of the inositol 1,4,5-triphosphate (IP3) receptor being in the open state is influenced by both IP3 and Ca2+. This duel system of control is thought to underlie Ca2+ waves and oscillations. 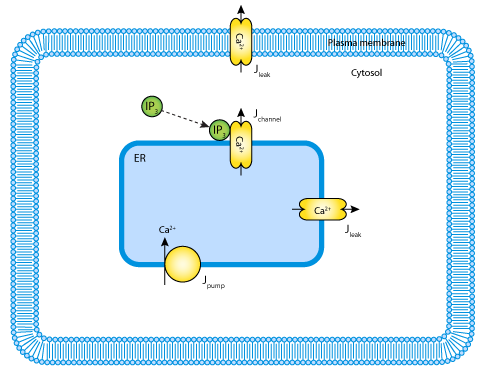 IP3 binding to the receptor activates the channel, causing a small amount of Ca2+ to diffuse out of the ER into the cytosol. This Ca2+ has a positive feedback effect, called calcium-induced calcium release (CICR), and it is thought to underlie Ca2+ wave propagation. At intermediate IP3 concentrations, a stable limit cycle appears in the kinetics, and the model becomes oscillatory. Under these conditions, wave propagation can occur even without excitability. Several mathematical models for Ca2+ wave propagation have been published (for some examples see DeYoung and Keizer's IP3-mediated Ca2+ release model, 1992 and Li and Rinzel's IP3-mediated Ca2+ oscillations model, 1994), all of which are similar. The mathematical model described here was published by McKenzie and Sneyd in 1998 (see the figure below). It describes the process by which IP3 diffuses through the cytosol and binds to receptors located on the endoplasmic reticulum (ER). These receptors also function as Ca2+ channels. They open upon IP3 binding, and Ca2+ diffuses out of the ER down its electrochemical gradient into the cytosol. Ca2+ is pumped against its electrochemical gradient out of the cytosol into the ER, and ions also leak into the cytosol from the ER and the external environment as they diffuse into the cytosol down their electrochemical gradient. Model simulations showed that spiral waves could be induced by simulating the release of IP3. Increasing the size of the IP3 additions caused a decrease in the rotation period and the breakup of the spiral wave solutions. Following this, irregular spatio-temporal patterns occurred. From their model simulations, the authors predict that a simple experimental procedure may be sufficient to reproduce unstable spiral waves. A schematic diagram representing the model. Derived from workspace Mckenzie, Sneyd, 1998 at changeset 68cf461c24ab.